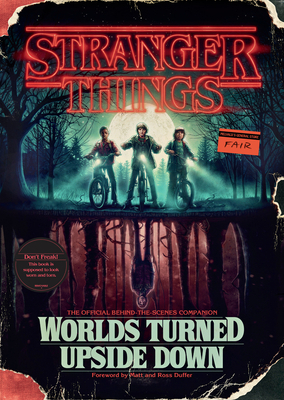 NEW YORK TIMES BESTSELLER • The official behind-the-scenes companion guide to the first two seasons and beyond, featuring exclusive color photos and stunning concept art. Note: This book has been designed to mimic a used book. The marks, scuffs, and tears on the cover and pages are an intentional design element. Stranger things have happened. . . .
• a look into the future of the series—including a sneak preview of season three! Adding whole new layers to enrich the viewing experience, this keepsake is essential reading for anyone and everyone who loves Stranger Things. Gina McIntyre is a veteran entertainment journalist who has covered movies, TV, and music for the Los Angeles Times, The Hollywood Reporter, and Entertainment Weekly. She is the author of Guillermo del Toro’s The Shape of Water: Creating a Fairy Tale for Troubled Times and The Art of Ready Player One. Her writing has also appeared in Rolling Stone online. She lives with her husband and daughter in Riverside, Illinois. Matt Duffer and Ross Duffer are film and television writers, directors, and producers, as well as twin brothers. They are the creators of Stranger Things, which has won five Emmys as well as awards from the Producers Guild of America and the American Film Institute.